“Be still and know that I am God,” Psalm 46:10, is a popular verse for comforting ourselves and others—many people tend to think this verse means to rest or relax in who God is. This verse does encourage believers to reflect on who God is, but there is more to this psalm than one verse—and verse 10 is actually more of a wake-up call to be in awe than a gentle call to rest. Taking time out of our day to meditate on Scripture and be silent with listening ears toward God is mentioned in other sections of Scripture (Psalm 119:15, Joshua 1:8, Luke 5:16, and others). But this command—“Be still…”—is written in the context of a time of trouble and war; therefore, we should consider the verse with that context in mind. Instead of interpreting “be still” as a gentle suggestion, the meaning in this psalm lends itself more to: “cease striving” or “stop” and more specifically in this context “stop fighting,” which is directed toward the enemies of the people of God. The people of God should interpret the command for themselves to read more like: ‘snap out of it,’ ‘wake up,’ ‘stop fearing’—acknowledge who your God is—be in awe! 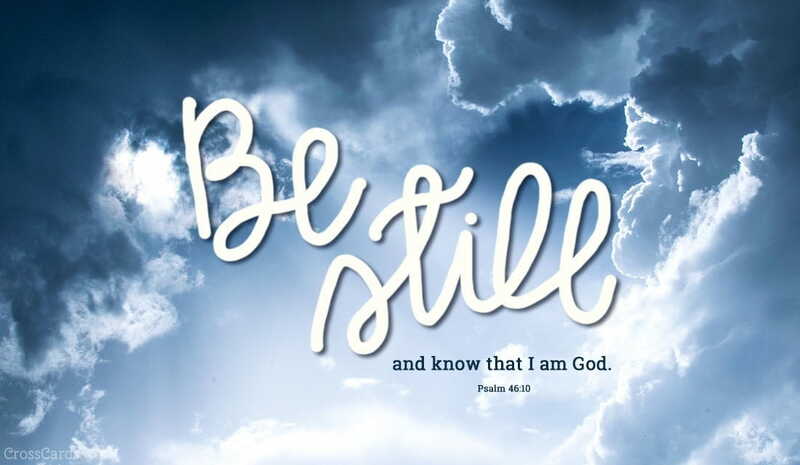 However, it is good to note that there’s nothing wrong with the words in the translation “be still;” those words are not incorrect, it is simply helpful to note the context of the phrase. Verse 10 has something to say to both the enemies of God and the people of God, but it is the people of God the psalm is written to. Verse 1 starts, “God is our refuge and strength” (emphasis added). The Psalms are for God’s people. Come, behold the works of the LORD, how he has brought desolations on the earth. He makes wars cease to the end of the earth; he breaks the bow and shatters the spear; he burns the chariots with fire. "Be still, and know that I am God. I will be exalted among the nations, I will be exalted in the earth!" The LORD of hosts is with us; the God of Jacob is our fortress. Selah” *Listen to the audio version. “To the Chief Musician. He who could sing other Psalms so well was fitly entrusted with this noble ode. Trifles may be left to commoner songsters, but the most skilful musician in Israel must be charged with the due performance of this song, with the most harmonious voices and choicest music. For the Sons of Korah. One alone cannot fulfil the praise, there must be picked choristers under him, whose joyful privilege it shall be to celebrate the service of song in the house of the Lord. As to why the sons of Korah were selected, see our remarks at the head of Psalm 42. It may be well to add that they were a division of the Levites who took their turn in serving at the temple. All the works of holy service ought not to be monopolised by one order of talent, each company of believers should in due course enjoy the privilege. None ought to be without a share in the service of God. Psalm 46 is a song for Zion, God’s holy city where his people dwell with him—the city is holy because God dwells in it. This psalm is all about security with God that God is our true home. It’s mostly written in third-person, but at verse 10 there’s a change and God speaks directly. Throughout the 11 verses, we also read several descriptions about God—his characteristics and attributes: he is our refuge, he is strong, present, and a great help to those who are weak. God is higher than all else and able to rule above all. At his voice the earth melts. "Stop [your fighting]-and know that I am God, exalted among the nations, exalted on the earth." “The psalmist goes on to encourage the godly to ‘know’ that the Lord is God. Though it was tempting to ally themselves with foreign powers, to rely on military strength, or to give themselves over to idolatry and pagan ways, the godly must learn to persevere to the end. The exhortation ‘be still’ calls on them to stop doing one thing in favor of something else. What their temptation was may be implied from v. 2: ‘Therefore we will not fear.’ Throughout the history of Israel and Judah, severe national distress brought the temptation to abandon true religion for the ephemeral security of political alliances, military strength, and worldly paganism. Instead of choosing a negative option, the people of God distinguish themselves by the pursuit of godliness: ‘Know that I am God.’ The knowledge of God includes factual knowledge about him, his past acts, and his promises. But in this context, the psalmist calls on them to commit themselves to the Lord and to seek his ‘refuge,’ ‘strength,’ and ‘fortress’ (vv. 1, 7, 11). The life of faith is lived continually in commitment to God’s sovereignty, rule, and ultimate exaltation over all the nations (cf. Hab 2:13–14).” (Bold emphasis added). “V.10 Be still, and know that I am God. The Psalmist seems now to turn his discourse to the enemies of the people of God, who indulge their lust of mischief and revenge upon them: for in doing injury to the saints they do not consider that they are making war against God. Imagining that they have only to do with men, they presumptuously assail them, and therefore the prophet here represses their insolence; and that his address may have the more weight, he introduces God himself as speaking to them. In the first place, he bids them be still, that they may know that he is God; for we see that when men are carried away without consideration, they go beyond all bounds and measure. Accordingly, the prophet justly requires the enemies of the Church to be still and hold their peace, so that when their anger is appeased they may perceive that they are fighting against God. "The New American Standard translates 'Be still' as 'cease striving.' 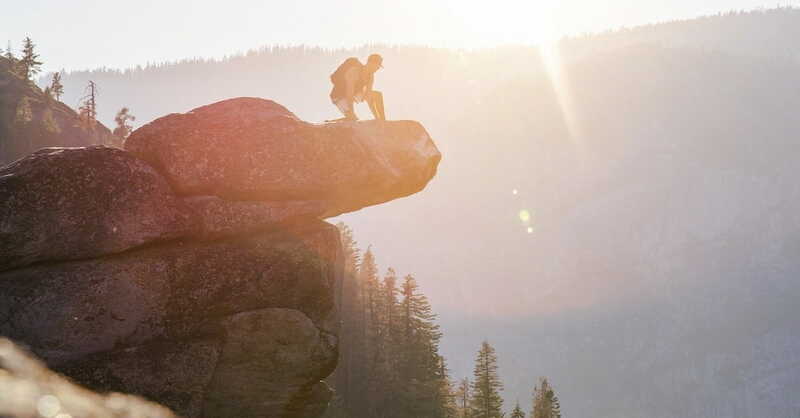 I think the focus of the message in this case is the people of God, since the Psalm begins 'God is our refuge and strength…' The goal is to point the Israelites to a knowledge that even though the nations may be powerful, that God is more so. Even the rage of nations only causes kingdoms to totter, but when God speaks the whole earth just melts! The Israelites are not ultimately responsible for their own protection, God is." At God’s voice the earth melts, the enemies cease fighting, and the people of God remember who their God is. God commands stillness and silence, but why is this important for the people of God? The people of God were prone to fear; they needed to remember who their God is. We don’t need to fear the end of our life—even in the midst of battle—because we’re going to that city; we’re going to Zion one day. We will dwell with God and there will be no more wars, no pain, and no end (See Rev. 21). We don’t need to fear what the world can do; we need to remember who our God is and we need to share that knowledge with others. So, there’s nothing wrong with the translation “Be still” in Psalm 46:10 vs. “Stop fighting” or “Cease striving,” and there’s certainly nothing wrong with believers taking time to be still and quiet before the Lord in prayer. That’s something Christians should do every day, and we have Jesus as our example for that in Luke 5. But is the quiet, meditative interpretation of “be still” the best interpretation for Psalm 46:10 based on the context of the psalm as a whole? Maybe not, as it may take away from the intensity of the psalm—the way that God can command the earth and everything in it to be still before him and it is. But here’s what we need to remember about the application of this verse and the different views. May stand-alone verses that we see on graphics or read in posts, like Psalm 46:10 always inspire us to read more of God’s Word. When we see the same verses in the future we will remember the deeper context of the passage and be thankful for who God is in our lives and the incredible things he is doing. And we get to be a part of it! Our amazing God, who is so far above us, allows us and encourages us to carry out his purpose with him. If we take away nothing else from this psalm, let us remember the call to spread God’s Word so that others may find the same security we have.